For blessings of Lord Vishnu and lakshmi for Complete happiness and success in life. The enerized Yantra Invoke the blessings of Lord Vishnu and Goddess Lakshmi for Complete happiness and success in life. 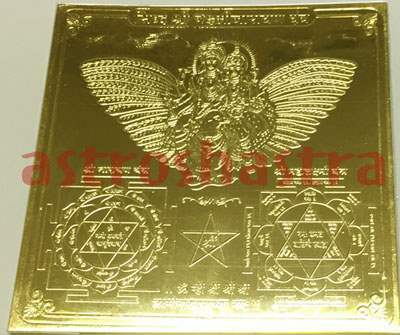 This is very power ful and effective yantra as worship of Lord Vishnu bring fortune and happiness and worship of Goddess Lakshmi brings prosperity, wealth and improved business. It is always recommeded that prayers are fulfilled only if Maa lakshmi is prayed along with Lord Vishnu as she stays where Lord Narayan stays. According to religious texts, it is recommended that every house shall have this Yantra installed in their puja ghar. It protects the sadhak and his family and Maa laskhmi stays in his home for ever. It can be placed on any Poornima or Ekadashi. It is very auspicious if Lakshmi Narayan Shaligram is kept along with Yantra. Daily darshan of both keeps sadhak positive and happy.